To improve disaster preparedness, mental health, and social cohesion among community members affected by disasters in Nepal and Haiti. An integrated disaster preparedness model incorporating preparedness and mental health in a combined community-based intervention. Evidence suggests that many people exposed to prior disasters do not engage in risk reduction, even when they have been exposed to prior disasters1, receive training, and have adequate resources2. Mental health symptoms, including those associated with prior disaster exposure, may influence engagement in preparedness3 (e.g., due to depression-related lack of motivation; avoidance of distressing disaster and preparedness-related thoughts4). Perceived preparedness for future disasters may in turn influence mental health (e.g., by increasing safety and efficacy). With these relationships in mind, we developed a 3-day community-based intervention incorporating both preparedness and mental health content, in collaboration with Soulaje Lespri Moun (SLM) in Haiti and Transcultural Psychosocial Organization in Nepal (TPO Nepal). This Mental Health Integrated Disaster Preparedness (MHIDP) intervention aims to improve preparedness, mental health, and social cohesion. The intervention has also been tested across 3 studies involving 8 flood and earthquake affected communities in both Haiti and Nepal, using randomized controlled trials and a matched cluster comparison (1,200 persons in total). "We learned the importance of helping each other. We can do much better if we work together in the community." Small group discussion: Small group discussions involve community members sharing opinions and debating topics such as local idioms of distress, beliefs about the cause of mental disorder symptomology, related stigma for mental health, and local preparedness techniques, rather than simply receiving content from the facilitators. Experiential components: Experiential components include opportunities to practice new coping skills, such as breathing and relaxation techniques, and interactive and engaging means of sharing content such as a ‘hot potato’ game to teach community members about physiological reactions to stress. A peer-based framework: The peer-support approach entails creating numerous opportunities for community members to provide and receive social support regarding mental health needs and to encourage collective approaches to disaster preparedness. Day 1: Ground rules and the importance of the peer support framework are introduced, followed by discussion about types of psychosocial reactions to disaster-related stress and associated coping strategies (such as self-soothing and relaxation skills). Specific skills, including self-reflection, self-calming, grounding, mindfulness and muscle relaxation are practiced together. Day 2: Participants continue the mental health and peer support focus by sharing stories about post-disaster “moments of safety” followed by an art-based activity entailing creation of culturally specific symbols of safety. The topic of disaster preparedness is introduced, including discussions regarding links between common cultural attributions for disasters and motivation for preparedness. Facilitators introduce common scientific explanations for disasters such as earthquakes and floods and share recommended preparedness strategies. This is done without discouraging pre-existing cultural and religious beliefs, or indigenous approaches to preparedness, which participants are encouraged to maintain alongside new information5. Day 3: During the final phases of the intervention, participants work on providing disaster and mental health related peer support to one another, drawing on techniques associated with Psychological First Aid (PFA) through role-playing a variety of brief disaster scenarios. Day three also entails discussion about the impact of disasters on particularly vulnerable groups – children and those with more serious mental health challenges – and practical skills training for supporting these individuals. Finally, a “Tree of Hope” exercise is used to encourage individual goal-setting and future planning, and a “Forest of Hope” is constructed to demonstrate community-level resilience through collaboration. The workshop concludes with a “mini disaster simulation” in which participants demonstrate skills learned throughout the 3 days. During the closing ceremony, participants receive certificates and disaster preparedness materials and discuss achievements and next steps. In order to ensure the acceptability of the intervention in both locations, efforts were made to adhere to best practice guidelines for the cultural adaptation of interventions6. In both settings, local staff facilitated the intervention and played key roles in model development and adaptation. Some specific elements of adaptation included coping mechanisms drawing on local stories, songs, and dance. Facilitators initially struggled with how best to address culturally specific beliefs that were potentially harmful to some group members. For example, during one discussion in Nepal, some members evoked karma to suggest that those who had lost family members in the earthquake were to blame for their deaths. Rather than directly challenging such perspectives, facilitators created space for community member-led discussion and for alternative views to be expressed by group members. Participants who had lost family were offered referrals for follow up support if desired and productive discussions for how to manage such challenges were implemented during ongoing supervision. During the initial planning stages, team members met with community leaders and local government officials to address scepticism about the value of an intervention focused on mental health and low-cost preparedness. Various stakeholders, including some participants, initially suggested that the intervention should provide tractors, building materials, or other material goods instead. Local staff were trained to facilitate discussion with participants about the value of mental health and preparedness training. Some of the project staff were also directly impacted by earthquake and flood events and were experiencing associated distress. In light of this, staff care training modules were incorporated into the intervention training and regular debriefing sessions were held throughout implementation. 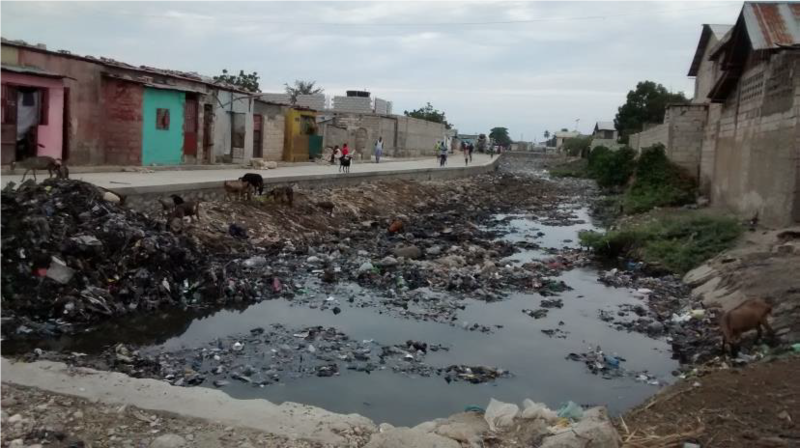 Project implementation in Haiti encountered significant participant attrition which was attributed to transience among the flood-affected quasi-homeless population in these communities (many were originally from IDP camps from the 2010 earthquake). In Haiti, reports of gang violence in some parts of the community led to delays or changes in the locations used for intervention data collection. In Nepal, a blockade on the southern border of with India resulted in a severe petrol shortage, creating significant difficulty in arranging transportation throughout Nepal. Additionally, data collection was postponed due to security concerns by the team due to violent protests and police hostility in particular regions. These events and ongoing associated tension resulted in a curfew in targeted communities that was not lifted until November 2015. 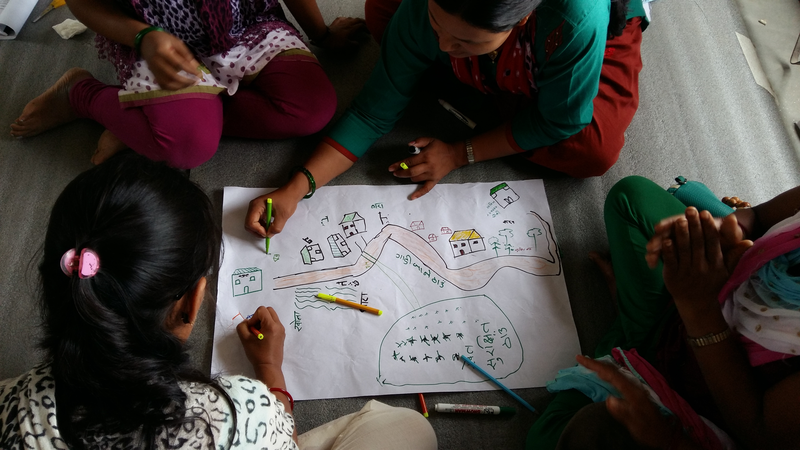 As part of this project’s dissemination phase in Nepal, additional MHIDP groups were implemented for nearly 600 earthquake-affected community members in Kathmandu Valley and flood-affected community members in Kailali district. In Haiti, MHIDP was implemented for 50 community members affected by Hurricane Matthew. The implementing organisations, TPO Nepal and SLM Haiti, are also able use the MHIDP curriculum as part of their regular programming. Dissemination workshops were held in both contexts for local and national government officials, NGOs, and educational institutions, including distribution of curriculum manuals. Given the effectiveness of this model in increasing preparedness and social cohesion and decreasing distress, we suggest MHIDP should be scaled up for use in other areas of Nepal and Haiti, and in other countries prone to natural hazards. This intervention can be culturally-adapted relatively easily. It is cost-effective and can be implemented by lay mental health workers, or trained clinicians, using standardized curriculum manuals. Randomized controlled trials were conducted with 480 flood- and earthquake-affected participants across three communities in metropolitan Port-au-Prince, Haiti, and 480 participants across three flood-affected communities in Kailali district, Nepal. Intervention effects were examined on outcomes related to disaster preparedness, mental health symptoms (depression, PTSD, and anxiety), functional impairment, social cohesion, and help-seeking and help-giving related to mental health and disaster needs. Data was also collected on culturally-specific coping strategies and attributions made for disasters and mental health difficulties. In addition, a cluster comparison study was conducted with 240 earthquake-affected participants in two communities in Bhaktapur district, Nepal. Data was again collected at three time-points, this time over a two-month period, beginning a few months after the 2015 earthquake. Interviews used an abbreviated interview schedule assessing similar outcomes to those listed above. Finally, focus group discussions were conducted with women participants, men participants, family members of participants, and community leaders in each setting. Costs for the above are dependent on typical costs in various contexts. Decreasing mental health symptoms (including depression, PTSD, anxiety, functional impairment) (in 2 of the 3 studies). It has also been associated with an increase in use of specific coping skills, and both disaster and mental health related help-seeking and help-giving. A total of 87 service providers working with earthquake-affected populations in Nepal were trained and 62 participants (including teachers and religious leader) took part in a Training of Trainers (ToT) in Haiti. In surveys collected before and after trainings, service providers reported a decrease in their own symptoms of depression and PTSD and increase in work satisfaction. Lin S et al. (2008). “Why are Flood and Landslide Victims Less Willing to Take Mitigation Measures than the Public?” Natural Hazards 44, no. 2: 305-314. Kohn S et al. (2012). Personal Disaster Preparedness: An Integrative Review of the Literature. Disaster Medicine and Public Health Preparedness, 6(3): 217-231. Eisenman DP et al. (2009). Variations in disaster preparedness by mental health, perceived general health, and disability status. Disaster Med Public Health Prep, 3(1): 33-41. James L et al. (2013). “A Pilot Assessment of Psychological Factors Associated with Hurricane Sandy Preparedness in Post-earthquake Haiti.” Quick Response Grant Report series, Natural Hazards Center, Institute of Behavioral Sciences, University of Colorado, Boulder: 246. James L et al. (2012). "Challenges of post-disaster intervention in cultural context: The implementation of a lay mental health worker project in post-earthquake Haiti." International Perspectives in Psychology: Research, Practice, Consultation 1, no. 2: 110. 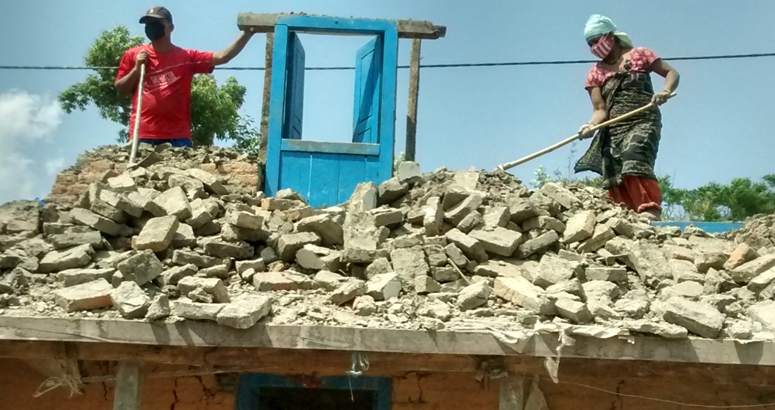 Integrating mental health and disaster risk reduction: Lessons from Haiti and Nepal. James L. E. & Welton-Mitchell C.